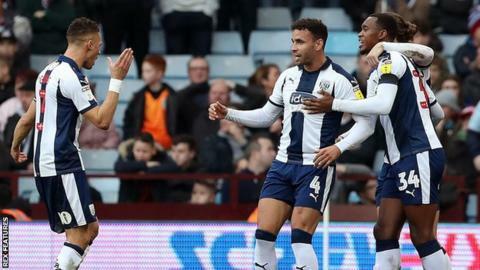 West Bromwich Albion were comfortable winners in the West Midlands derby as two goals in four late first-half minutes disposed of punchless Aston Villa. With top scorer Tammy Abraham firing blanks for once, Villa were well beaten as their total of home goals conceded this season rose to 32 in 17 games, the worst in English football's top four divisions. Hal Robson-Kanu headed the first on 41 minutes, before Baggies joint top scorer Jay Rodriguez fired home a 20-yard shot off the post just four minutes later, although a subtle deflection took it beyond Villa keeper Lovre Kalinic. Fourth-placed Albion stay within six points of top spot in the Championship - but Villa are now seven points adrift of the play-off places. Villa wasted their best chance early in the first half when Abraham, who had scored in all his side's last eight home games, for once fluffed his lines. After Albion's defence got in a right muddle, Andre Green's square pass found Abraham unmarked 12 yards out, but he took a poor first touch and that gave Sam Johnstone - who was on loan at Villa last season - the chance to dash off his line and make a scrambled brave save. Even before that, Villa had already survived a scare themselves when Holgate sneaked in round the back at the far post, only to be thwarted by a desperate sliding challenge from Tommy Elphick. Villa then went close again when Kortney Hause headed just over from Conor Hourihane's free-kick, but Albion's Jacob Murphy was twice denied by saves from Kalinic before the visitors broke through. Robson-Kanu's fourth goal of the season - and his first in three months - was rapidly followed by a 17th of the season and second in five days for Rodriguez. And they were rapidly followed by the half-time whistle - and the exit from the contest of Villa keeper Kalinic, who had earlier received first-half treatment. The hosts did threaten more after the break as Elphick's header bounced off the top of the bar, and John McGinn - booked for the 10th time this season - had a shot parried before Ahmed Elmohamady's header crept wide. But Villa have now won just once in nine matches and few will give them any chance of making the play-offs. On a day when Albion became the first side to stop Villa scoring in a Championship home game this season, one rare bright spot for the hosts was the reception given to the introduction of exciting local-born teenager Jacob Ramsey for his debut. "We're making it hard for ourselves. We didn't have enough quality in the final third to put enough decent balls in. But, If Tammy takes that early chance, it's a different story. "There was nothing in it, then Robson-Kanu gets his head on a cross and I don't think any keeper in the world would save that. It's looped over a 6ft 7ins keeper. Then we make a mistake, Rodriguez scores off his foot this time, from outside the box, in off the post. "Kalinic came off after a kick on the head. He was dizzy at half-time. He comes from a league where keepers are more protected. "The injuries haven't helped. Now we lose McGinn to suspension as well. It's where we're at. And why we had to stick a 17-year-old kid (Jacob Ramsey) on for his debut for the last half hour." "Not many teams will keep clean sheets here. We knew It would be a stern test but we had the right answers, especially once we got in the lead. "We knew what resilience they have here. I was here to see their comeback against Sheffield United myself. "But we have people like Gareth Barry. He gives you wonderful composure. He's a calming influence, not overawed by the atmosphere. "We were ready for the loss of Dwight Gayle. There's no use crying over spilt milk. We accepted it and moved on. But we'd already passed our audition on how to cope without him. He got injured early in the season and we managed without him then too. But we're still looking forward to getting him back for the Sheffield United game." Match ends, Aston Villa 0, West Bromwich Albion 2. Second Half ends, Aston Villa 0, West Bromwich Albion 2. Attempt missed. Jacob Ramsey (Aston Villa) left footed shot from the centre of the box misses to the right following a corner. Corner, Aston Villa. Conceded by Kyle Bartley. Corner, Aston Villa. Conceded by Craig Dawson. Corner, Aston Villa. Conceded by Ahmed Hegazi. Offside, Aston Villa. Glenn Whelan tries a through ball, but Jonathan Kodjia is caught offside. Substitution, West Bromwich Albion. Stefan Johansen replaces Gareth Barry. Delay in match Gareth Barry (West Bromwich Albion) because of an injury. Offside, Aston Villa. Kortney Hause tries a through ball, but Tammy Abraham is caught offside. Foul by Jonathan Kodjia (Aston Villa). Mason Holgate (West Bromwich Albion) wins a free kick in the defensive half. Attempt missed. Ahmed El Mohamady (Aston Villa) header from the centre of the box misses to the left. Assisted by John McGinn with a cross following a corner. Corner, Aston Villa. Conceded by Sam Johnstone. Attempt saved. John McGinn (Aston Villa) left footed shot from outside the box is saved in the top right corner. Assisted by Kortney Hause. Substitution, West Bromwich Albion. Kyle Bartley replaces Jacob Murphy. Tammy Abraham (Aston Villa) wins a free kick in the attacking half. Foul by Craig Dawson (West Bromwich Albion). Attempt blocked. Glenn Whelan (Aston Villa) right footed shot from outside the box is blocked. Assisted by John McGinn. Jonathan Kodjia (Aston Villa) wins a free kick on the right wing. Foul by Ahmed Hegazi (West Bromwich Albion). Substitution, Aston Villa. Jonathan Kodjia replaces Andre Green. Foul by Kortney Hause (Aston Villa). Jacob Murphy (West Bromwich Albion) wins a free kick in the defensive half. Corner, Aston Villa. Conceded by Mason Holgate. Foul by Andre Green (Aston Villa). John McGinn (Aston Villa) wins a free kick on the right wing. Foul by Gareth Barry (West Bromwich Albion). Foul by John McGinn (Aston Villa). Sam Field (West Bromwich Albion) wins a free kick in the defensive half. Substitution, Aston Villa. Jacob Ramsey replaces Conor Hourihane. Offside, West Bromwich Albion. Rekeem Harper tries a through ball, but Jay Rodriguez is caught offside. Attempt missed. Kortney Hause (Aston Villa) header from the centre of the box misses to the right. Assisted by Glenn Whelan with a cross following a corner. John McGinn (Aston Villa) wins a free kick on the left wing. Foul by Rekeem Harper (West Bromwich Albion). Attempt blocked. John McGinn (Aston Villa) left footed shot from the left side of the box is blocked. Alan Hutton (Aston Villa) wins a free kick on the right wing.